Taking On-Site donations has never been easier. Accept donations from anyone, anywhere. Kind Base's kiosk gives you the ability to quickly accept donations or event registrations and let donors set up recurring gifts. All from a simple kiosk that's customized just for you. Accept Donations: Your donors can make their gifts easily with just a swipe of a credit card or debit card. Donations take only a few seconds, and supporters can easily set up recurring donations to your organizations. Every gift is easily managed from the included Kind Base online platform. Event Registrations: Let your supporters sign up and pay for events right on your kiosk. You can customize your events, set-up ticket packages, establish sponsorship levels, and more. Last minute registrants aren't a problem: kiosks can be used to let them pay right at the door. Your Kiosk Your Brand: Customize your kiosk with your organization's color scheme, logo and unique overall feel. We will customize your giving platform to match with your website's look and feel. 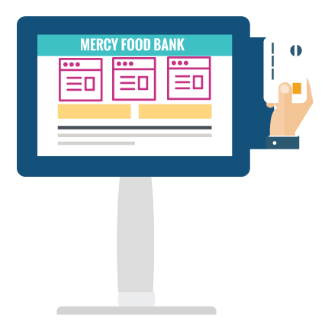 No two organization are alike, and your donation kiosk should reflect that. We'll help you set up specific options that fit our organization best, from event details to suggested donations amounts to fundraising campaign.